There are two popular myths concerning the relationship between communism and nationalism. The first is that nationalism and communism are wholly antagonistic and mutually exclusive. The second is the assertion that in communist Eastern Europe nationalism was oppressed before 1989, to emerge triumphant after the Berlin Wall came down. Reality was different. Certainly from 1945 onwards, communist parties presented themselves as heirs to national traditions and guardians of national interests. The communist states of Central and Eastern Europe constructed "socialist patriotism," a form of loyalty to their own state of workers and peasants. Up to 1989, communists in Eastern Europe sang the national anthem, and waved the national flag next to the red banner. The use of national images was not the exception, but the rule. From Cuba to Korea, all communist parties attempted to gain national legitimacy. This was not incidental or a deviation from Marxist orthodoxy, but ingrained in the theory and practice of the communist movement since its inception. The study of communist national legitimacy is an exciting new field. 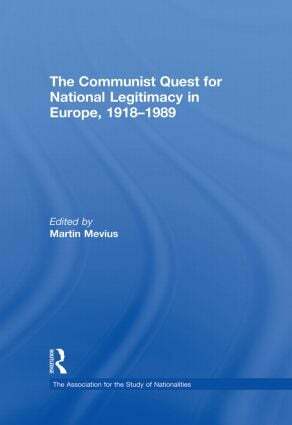 This book presents examples of communist attempts to co-opt nationalism from both sides of the iron curtain and lays bare the striking similarities between such diverse cases as the socialist patriotism of the Bulgarian Communist Party and the national line of the Portuguese communists, between Romanian communist nation building and the national ideology of the Spanish Communist Party. This book was published as a special issue of Nationalities Papers. Martin Mevius was educated at the universities of Oxford (D.Phil. ), Cambridge (M.Phil. ), and Amsterdam (MA). He published his first monograph, Agents of Moscow: The Hungarian Communist Party and the Origins of Socialist Patriotism, 1941-1953 (Oxford: OUP 2005) to critical acclaim. He has also published widely as a journalist in the Dutch and British media, among others for The Guardian and Private Eye. Presently he is a postdoctoral researcher at the University of Amsterdam. The books in this series focus on the dynamics and interactions of significant minority and majority nationalisms in the context of globalisation and their social, political and economic causes and consequences. Each book is focused on an important topic drawn from the rigorously peer-reviewed articles published in Nationalities Papers and Ethnopolitics, and includes authoritative theoretical reflection and empirical analysis by some of the most widely recognized experts in the world.